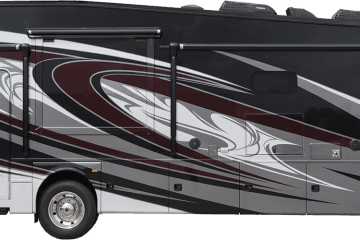 Champion 75537i: My favorite RV generator of all time! My Champion generator hooked up to the Harmer Family Camping Machine! 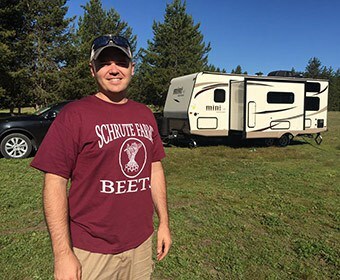 When I bought my new 25′ travel trailer, I bought a Champion 75537i inverter generator with remote start, and I’ve been really happy with it so far. I wanted to provide a REAL review from an ACTUAL owner, instead of those blogs that just recommend stuff to get a commission even if they have never used the product. The Champion 75537i boasts 3100 watts of peak power and 2800 watts of continuous power. 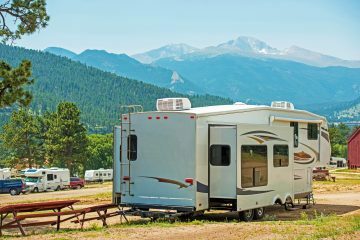 In short, the Champion 75537i is a reliable, remarkably quiet, inexpensive generator that is powerful enough to run most RV air conditioners and comes with one killer feature–a remote control. It’s not a perfect generator and has its quirks which I’ll mention in this review, but I’m happy with my purchase and wouldn’t trade it for anything else. In fact, I’m happy enough with this generator that I bought two of them. After owning this generator for almost a year now, I just wanted to give an update. I still absolutely love it and have not had any performance issues. The only issues I have had were (1) the cotter pin fell off which secures the wheel so I put on a better one, and (2) I had to replace the little battery in it for the electric start. This was a simple $15 fix. It still starts up immediately. No performance issues. 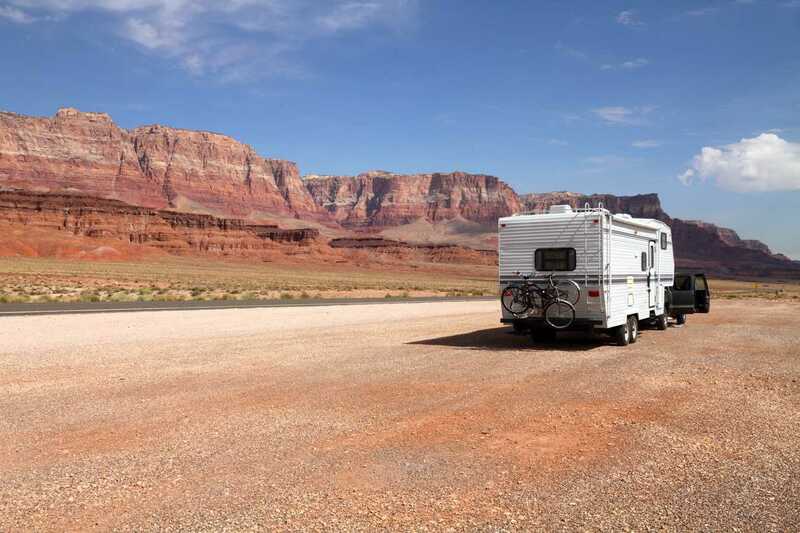 For most 13,500 AC units (most common type on travel trailers), you’ll have no issue powering your AC. At least, it runs my AC unit on my Rockwood 25′ travel trailer without any issues. The only thing to be aware of if you’re a new trailer owner is that the AC uses a LOT of power. So don’t plan to be using the microwave at the same time as the AC. When you run the AC, you’re just running the AC, two or three lights, and the TV. However, as long as you recognize that the AC needs to run alone, you’re fine. You can power a couple additional things, but not much. This will power your AC unit if yours is anything like mine. I’m really impressed with how quiet this generator is. In fact, it sounds BARELY any louder than my dad’s Honda 2,000 watt generators that he runs in parallel to get roughly the same power as this single unit. The Champion makes a much lower/deeper sound than the Hondas, so it carries a little more. But the volume is about identical. Officially, this generator is rated at 58 decibels and I have testing to confirm that number as being accurate. For reference, that’s the same loudness as normal speech. 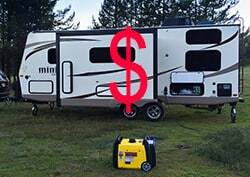 If you extend your camper’s cord to the generator and you turn the generator so the exhaust side (the loud side) faces away from your travel trailer, you’ll barely hear the SLIGHTEST hum while inside. Outside the trailer, it’s quiet enough to carry on a normal conversation as long as you aren’t right next to the generator. You really won’t find another generator that is perceptibly quieter than this Champion generator. The comparable Yamaha is advertised to run at “53 to 60 decibels”, so it’s essentially the same. The Honda advertises “48 to 58 decibels” so it’s the same or maybe just BARELY quieter. 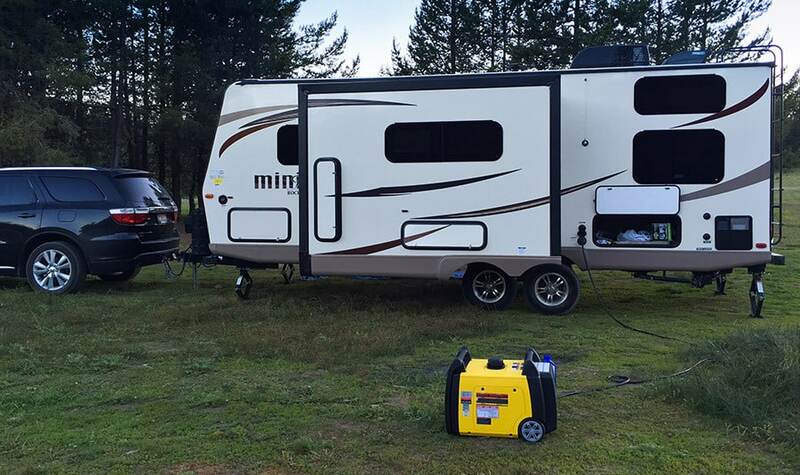 The 75537i also has an economy mode, which runs the generator more efficiently and quietly when only a small load is put on it (powering outlets in the RV, lights, charging battery, etc), and then allows it to automatically rev up when a greater load is put on it such as powering the AC. One thing that really cuts down the sound is if you face the exhaust of any generator (not just this one) away from the trailer or wherever you’ll be. The exhaust side of the generator is quite a bit louder, so you’ll see a significant reduction in sound by turning it to the other direction. Another thing that can help is to get a longer power cord from the generator to the trailer. But seriously, you’ll find that this is one of the quietest generators out there. The Honda is a LITTLE quieter, but only BARELY. I haven’t done a side-by-side comparison with the Yamaha, but the specs list the Yamaha as just slightly louder than the Honda, so I bet it’s equal to this Champion. If you choose something other than this generator, be sure you aren’t getting something too loud. A few years ago I was at a campground in Stanley, Idaho when the guy with the RV next to us started up his generator. It was very annoyingly loud. Too loud for a campsite where others were. As if that wasn’t bad enough, a few minutes later his wife comes down the steps of the RV and plugs in… you guessed it! A crockpot! And they left the generator running for 6 hours to power their crockpot. Please, please don’t buy a loud generator! Okay, I know it’s not gas “mileage” since you’re not actually moving, so should we call it gas “usage”? I don’t know. Anyway, the generator has a 2-gallon gas tank, and it’s advertised as giving 8 hours of continuous usage on a tank. I find that it gives me about 5 or 6 hours of usage running the air conditioner before I need to feed it again. Not bad at all–especially for a generator of this wattage. One question with any generator is how steadily it can output. Sometimes you’ll get a generator that has lots of dips in power output. I have found the 75537i to be pretty steady. Every once in a while if I’m really pushing the limits of what it can do with lots of things turned on in addition to the AC, it’ll have a dip and kill it. But if I’m just running AC, no problem. It runs it without ever having any shut-offs. One REALLY IMPORTANT TIP is to set your thermostat to 75 or 80 when using any generator. When it’s hot outside, the AC unit will draw a TREMENDOUS amount of power if it’s hot inside and you set your thermostat to under 70. That will kill the power on just about any generator. Start with the thermostat up at 77 or so, then once it cools down you can slowly reduce the temperature a little more. The generator also has an “economy” mode, which runs at a lower speed and quietness when a lighter load is put on it, and at a higher speed when there is a heavy load put on it. That’s nice for conserving gas and making it even quieter than it already is. There are three ways to start this generator, which is really nice for when something goes wrong. The first way to start the generator is the one that I’ve never needed to try–the pull cord. It’s there for when something goes wrong, but so far I’ve never needed to try it. The second option is a simple button with an on/off switch. I use this one frequently to start the generator. I messed this up initially because I was holding down the start button until it started. I learned that you just need to tap the “start” and not hold it. There is also a choke button nearby that you can push while you press start, but it’s been working fine for me without even needing that. My favorite way to start the generator is by using the remote control. We keep it in a drawer in our Rockwood travel trailer and use it to start the generator. It’s SOOO handy to have a remote start for the generator! We just set it up and plug it in when we get to the campsite, and then we can turn it on and off from the comfort of the trailer any time we need. It’s awesome for heating up a baby bottle in the middle of the night, using the microwave, or turning on the air conditioner when needed. It makes the generator 10x more convenient. The remote start is claimed to work from 80 feet away. I’ve never needed to do it from that far, but I will say that I can use it in my trailer with the windows closed and everything and it’s never missed the start button. Always starts up immediately on the first click. One odd quirk is that the manual says not to start the generator with a load already on it (cord plugged in and things ready to be powered). That’s weird because it’s advertised as having a 10-second delay so it can start up before sending juice through the lines so it doesn’t kill it, and would obviate the need for remote start. I think this is more legal speak than anything else because I started it many times with a load on it and never experienced any issue whatsoever. It always handles it just fine. I know the Yamaha and Honda generators have the reputation, but they don’t have the remote start feature, and it’s most definitely worth getting. The generator is definitely heavy, but not heavier than models from other companies of similar size. I’m 31 years old and have an average fitness level and I’m able to lift and move the generator by myself without any issue. The ideal situation is if you have a pickup to pull your trailer. If that’s the case, you can just leave the generator in the truck bed the entire time you’re camping without even moving it. I tow with a Dodge Durango (7,100 lbs tow capacity), so there’s no truck bed to store mine in. It’s a bit of work to lift it out, but it’s certainly doable. The generator does come with wheels, so once you set it down, you can wheel it. I haven’t been super happy with the wheels. They spin fine, but I do wish they’d given the wheels a higher clearance so the bottom doesn’t drag on the ground when you’re on softer dirt when camping. There is a really nice oversized handle to pull the generator around, which is really nice. In general, I think the weight and portability is a negative to any generator of this wattage, but I personally am glad that I didn’t sacrifice on power. My dad bought a lighter generator so he could lift it easier, and he’s always been frustrated that he can’t run the AC with it reliably. I bought both of my Champion generators on Amazon. Amazon has awesome two-day shipping right to my door, has a great return policy, and I don’t have to pay sales tax when I buy on Amazon. Also, if you find a better price after buying, they always take care of you. 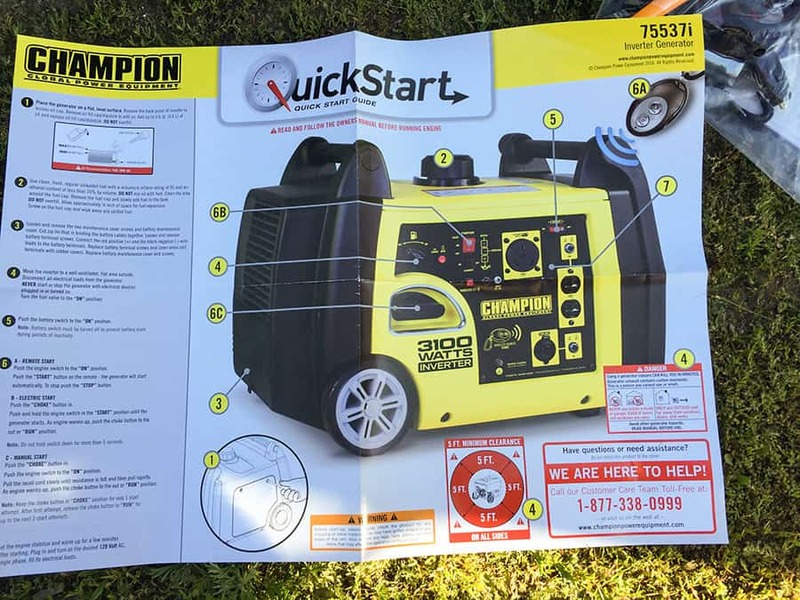 I paid $968 for my Champion 75537i Inverter Generator, plus a few dollars for shipping. You can buy a cheaper version that doesn’t include the remote start, but seriously…. you’ll use the remote start. I use the remote start more than I use the button on the generator. Check the current price of this generator on Amazon.com (affiliate link to Amazon for the exact model I’m reviewing here). Be sure to watch what you’re getting if you order from another online store. 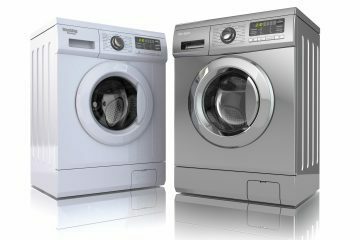 There are several similar models with about the same name, so be sure it has included all of the things I’m reviewing here. I actually looked for this generator in a few local stores and it was out of stock EVERYWHERE because it’s been very popular. One negative is that the generator did NOT come with the oil that it needs. 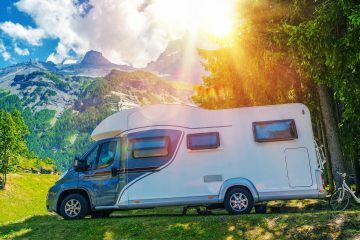 It’s not a big deal since it’s a commonly available formula, but it’s something you need to make sure you have before heading up into the mountains with your new generator. It takes .6 liters of 10W-30 oil. The generator box includes a little cigarette lighter to usb adapter so you can plug in a USB power cord to the generator. I doubt I’ll ever use this, but it’s there. It also has a funnel for pouring in the oil, which, given the location of the oil spout, is a necessity. It also has a cable to allow you to jump start a battery terminal so you can charge the onboard battery (which powers the starter). Setup of the generator took me about 10 minutes. It’s really only a matter of unscrewing one side panel to hook the cords to the little battery, then pouring in the oil (purchased separately), and starting it up. There is a color quick start guide that is written in real English (miracle!). I haven’t owned my generator for a real long time yet, but I’ll keep this review updated if I have any problems down the road. 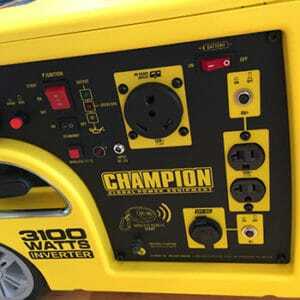 I read as much as I could from owners of this generator from buying and the reviews I saw were more positive than most of the other brands I looked at. UPDATE: I did have one very minor issues a few months after buying it. One of the wheels came off. There’s a cotter pin to keep the wheel on and it just wasn’t strong enough. I’ll probably replace it with a stronger cotter pin and it’ll be fixed. Also, I do wish the wheels were slightly larger to go over rocks and bumps and dirt more easily. Not a big deal. Generally, I think the Champion will probably have a few more maintenance issues than a Yamaha or Honda, but then again, it costs half as much as one of those brands, so I could literally buy TWO of these for the same price if I ever have any problems at all. The manual for the generator says you’re supposed to change the oil every 100 hours of use. For me, that’ll be just about perfect if I just drain the oil and replace it every Spring and then I can use it for the whole camping season. Any additional comments since your last post? Just bought the same camper as you and I am actively generator shopping. Thanks for any additional information. Have your Dad look into a Sure Start single phase soft starter. Hypereng.com. From my research a Honda 2000 inv. gen. should run a 13.5k A/C. Gizmo cuts down on amp. Draw at startup. Very Interesting. You Tube has a vid on it. I messed up. It’s the micro-air soft start. I highly recommend combining a generator with an inverter/battery setup. Our 20 year old Alpenlite 5th wheel has a 2000 watt inverter/charger with a 400 ah battery bank. 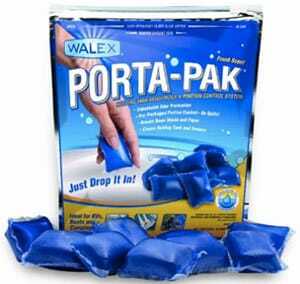 Great for watching TV after generator hours or making afternoon coffee at a rest stop. We also use it to make crockpot meals while we drive. The charger is a 3 stage type which will charge the battery bank to 80% in about 3 hours with a 5 amp A/C source – perfect for a small generator. Has the no load at start issue been addressed? What use is a remote start if you can have nothing plugged in at start up? Like Jim mentioned in the article, this is probably legal speak to cover their liability in case something happens. I’ve used this generator just like Jim has with main power for the camper plugged in. I used the remote to start it in the middle of the night when it got a bit chilly for my kids and it started up and ran with no problem. I don’t think it’s a real concern. I bought one and loved it. Decided I would not need all the cool features and left it home for backup when I am on the road 10 days a month. I bought a Honda for the road. 2000. What a piece of junk, pull start, oil sensitive to within millimeters. Basic, expensive and LOUDER and more expensive. I bought a second Champion, very happy. Honda Hype, sold on Craigslist for small loss, had 40 hours on it. Champion Performance! 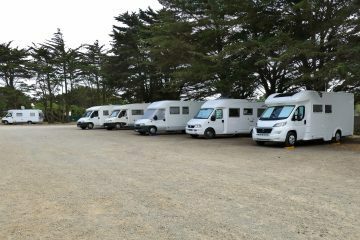 By the way I run mine 80 hours per month 8-10 hours at a time running household A/c in my cargo conversion and a couple of lights. Not much. Agree with reviewer, buy the remote, cool feature. Bought a 3100 inverter two years ago, used it during a power outage. Had to clean the carb every time I used it. This weekend it ran for 5hrs. shut it down for the night. Next morning gave it one pull and it sputtered. valves move, can turn it over by hand but no fire. I have been searching for a good, dependable generator. I want to thank you for your well written and informative article on this generator. You have narrowed my choice down and this generator now is at the top of my list. I have carefully reviewed your reviews and they were very helpful. Thank you again. 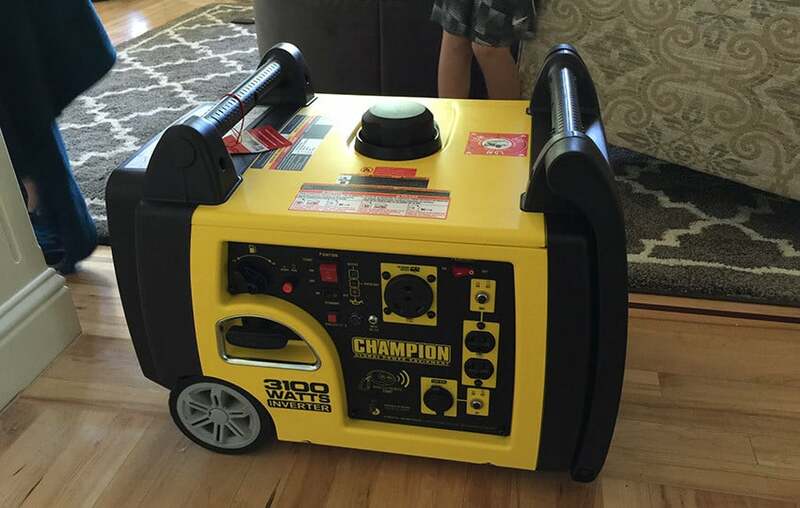 I don’t even need a generator, but after reading this post I’m thinking about getting one. I would definitely get the Champion 75537i inverter generator. I always thought the Honda was the best however after reading this post I definitely would switch. Thanks for the great post! I agree with reviewer. I have this generator for 3 months and it is everything thing that is proposed. It easily powers my 13.5 AC and most everything else at the same time except microwave. I have 2018 Jayco X23b with LED lighting which helps. If I can’t turn the ac unit to fan while using the microwave, I probably shouldn’t be camping😊. This past weekend I used it to power 2 inflatables at our church picnic and the blower motors drowned out the noise of this very quiet generator as it idled along in economy mode.